Have you been bitten by the big-cube bug? The quest for big cubes doesn't have to lead to a big block anymore. Now you can add cubic inches to your current power plant without having to swap intakes, headers, motor mounts, and other accessories all at once. By building a big-cube small block, you can have all the additional torque and horsepower of a big block, without all the extra weight, expense, and effort. In this book, Graham Hansen takes a step-by-step approach to selecting the best OEM or aftermarket block, crank, rods, and pistons to construct your big-inch short block. He also discusses how to select the best heads, cam, and induction and exhaust systems, specifically for a big-inch engine. In addition, the final chapter includes seven different combinations for big-inch power, complete with dyno graphs! Have you been bitten by the big-cube bug? The quest for big cubes doesn&#x2019;t have to lead to a big-block anymore. Now you can add cubic inches to your current powerplant without having to swap intakes, headers, motor mounts, and other accessories all at once. By building a big-cube small-block, you can have all the additional torque and horsepower of a big-block, without the extra weight, expense, and effort. Most of us have heard about swapping a 400 crank into a 350 block, boring it .030-inch over, and ending up with a 383. But what machine work is required, and what else needs to be changed? 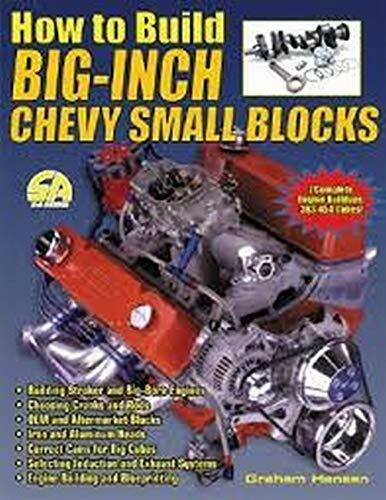 This book answers these questions and describes how to combine the best OEM and aftermarket support for creating a big-inch Chevy in just about any size you can imagine, from 377 to 454 street-thumping cubic inches. In this book, Graham Hansen takes a step-by-step approach to construct your big-inch short block. He also discusses how to select the best heads, cam, induction and exhaust systems, specifically for a big-inch engine. In addition, the final chapter includes seven different combinations for big-inch power, complete with dyno graphs! Books are returnable for any reason within seven days. We accept checks,money orders and all major credit cards. Postage via priority mail is $8.50 for the first book and $1.50 for each additional book. Media mail shipping is $3.50 uninsured for the first book and $1.50 for each additional book. Please note that it is strongly recommended that the customer insure all purchases as I cannot be responsible for books lost in the mail. Orders usually ship within 2 business days. Shipping costs are based on books weighing 2.2 LB, or 1 KG. If your book order is heavy or over sized, we may contact you to let you know extra shipping is required. Always Superior Books,Contact name: Barney Barnhart, email: asbarnhart@bellsouth.net, Address: 3940 Clubland Drive, Marietta,Ga.30068. Phone 770-977-8040.